South Africa has ratified the Tripartite Free Trade Agreement, becoming the fourth country to do so after Egypt, Uganda and Kenya. This is according to a notification sent by the South African Government to the Chair of the Tripartite Task Force, Ms. Chileshe Kapwepwe, who is the Secretary General of COMESA. The process of ratification has been set in motion in a number of member states and it is expected that this target will be reached by end of April 2019, which is the deadline that the Tripartite member states set for themselves. With this latest development, 10 more ratifications are now needed for the Agreement to enter into force. “This development adds to the aura of expectations around the Tripartite Free Trade Area Agreement which groups 29 of the 55 countries negotiating the African continental Free Trade Area,” the COMESA Director of Trade and Customs, Dr Francis Mangeni, who is also a member of the technical negotiating team, said in Lusaka on Tuesday, adding that all the Annexes to the TFTA Agreement have been concluded. On the basis of the provisions on transitional arrangements, he explained, once the threshold for minimum number of ratifications is achieved, then implementation of the Agreement commences immediately, on the basis of the principle of variable geometry. This is aided further by the fact that exchange of tariff offers is near complete. 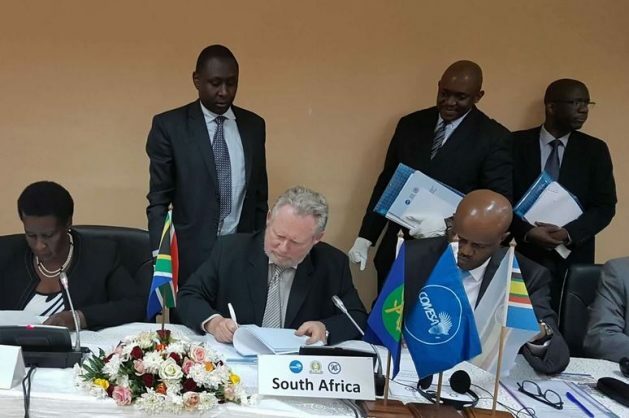 All the member states, save for Southern Africa Customs Union (SACU) countries, EAC countries and Egypt chose to offer their respective Regional Economic Communities’ preferential arrangements and were therefore not negotiating tariff offers. Negotiations on the Tripartite rules of origin are highly advanced. From the total of 5,387 tariff lines, Rules of Origin have now been developed for 3,267 tariff lines (At 6-digit HS 12 version), representing 60.8% of all the tariff lines. In addition, a draft manual on application of the Rules of Origin has been developed and is ready for use. Trade can therefore commence on all the aforesaid tariff lines. A number of tripartite instruments have also been developed and are now ready for use. The tripartite guidelines on implementation of Trade Remedies are ready for use and so are certificates of origin, export declaration and import declaration forms among others. In addition, the Tripartite Agreement on the Movement of Business Persons has also been finalized and will be ready for use once it undergoes legal scrubbing. “This latest ratification, moves the Tripartite process one step closer to the implementation stage, and it is likely to present more scope for early harvest and by extension, prospects for fast tracking the continental integration agenda,” Dr Mangeni said.